press room PoINT Software - good news! Siegen. 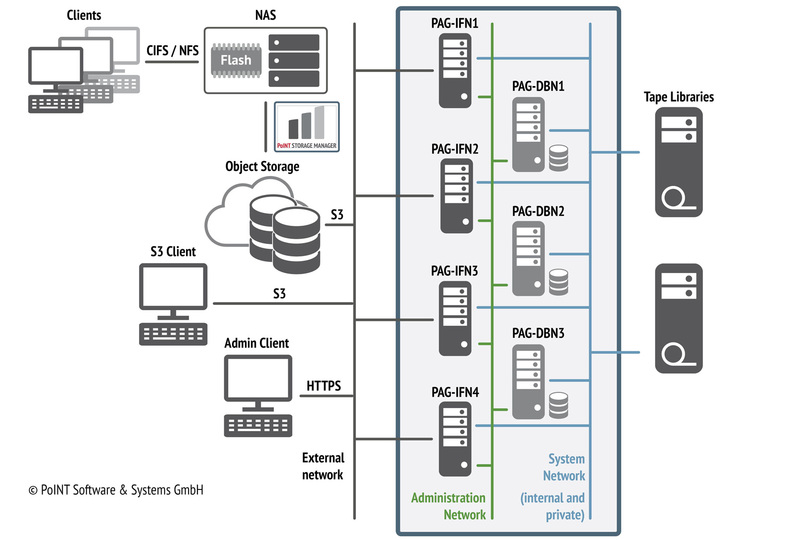 The PoINT Archival Gateway, a new software solution from PoINT Software & Systems GmbH, combines high performance, scalability and high availability of data. It receives data via an S3 interface which it then archives on storage systems such as tape or optical libraries. Integrated erasure coding ensures that data is distributed redundantly, improving the system’s reliability and performance. The PoINT Archival Gateway will be available in Q2 2019. Siegen. The Max Planck Institute for Heart and Lung Research (MPI) has freed up terabytes’ worth of measurement data by adopting the PoINT Storage Manager, benefiting in a number of ways as a result. The institute has been able to reduce costs and backup times while also enabling audit-compliant archiving of its research data. Siegen. Version 6.3 of the PoINT Storage Manager, available now, enables access to data from any location, on any platform, using a graphical web interface. The software also offers archive storage analysis, which allows administrators to clearly see at any time how much capacity is being used on each storage medium and how often data is accessed. Siegen. PoINT Software & Systems GmbH has released version 6.0 of its data and storage management software. The new release focuses in particular on retention management functions which allow users to securely store and manage their data. The PoINT Storage Manager therefore helps users to implement all aspects of compliance Guidelines. Siegen. NetApp has certified the PoINT Storage Manager for the compliance software NetApp SnapLock with ONTAP 9.0. NetApp SnapLock enables secure, compliant and long-term data storage with WORM functionality on systems such as NetApp Nearline Storage. Working with the PoINT Storage Manager, users can efficiently archive rapidly rising amounts of inactive data, and thus saving primary storage without having to change any existing applications or established access processes. Siegen. 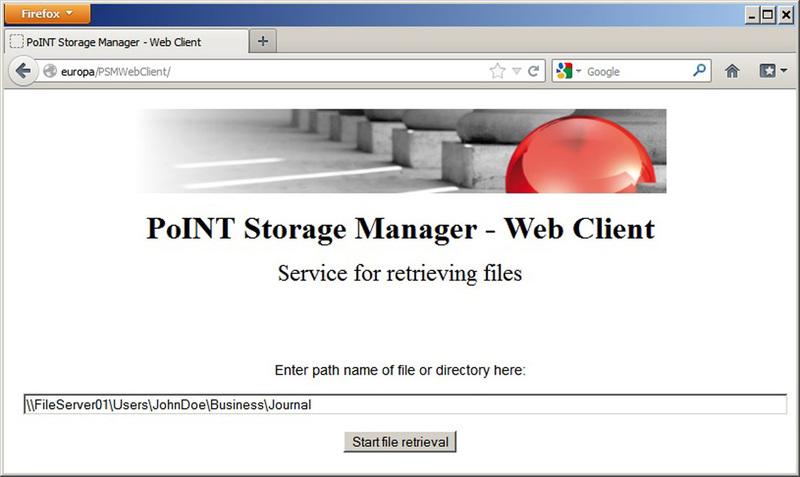 The new version 5.1 of PoINT Storage Manager comes up with versatile novelties. The development was mainly focused on the support of object-based storage systems. Furthermore inactive data can now also be purged as objects to the Capacity Tier. Enhanced data protection and security functionalities, the possibility to include additional storage systems as source, an improved client/server communication as well as the option to migrate systems to be replaced to EMC VNX complete the functional range of PoINT Storage Manager 5.1. Siegen. The Archive Edition of PoINT Storage Manager is available from now on. By this new and easy to use edition primary storage can be employed more efficiently by archiving inactive data to secondary storage systems. Thus the higher archiving requirements are fulfilled and at the same time high investment costs can be avoided. By supporting versatile storage technologies the software manufacturer, PoINT Software & Systems GmbH, ensures the independence from specific hardware manufacturers. In addition consistent usage of standards provides an investment protection. Siegen. 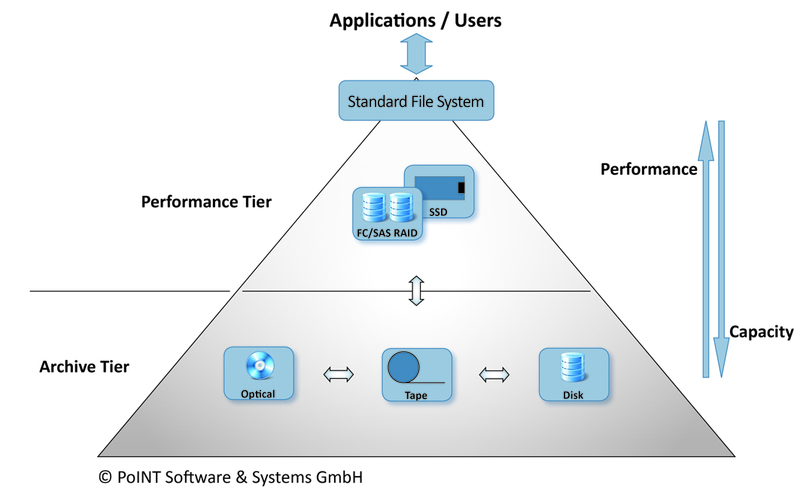 PoINT Software & Systems GmbH has released version 5.0 of PoINT Storage Manager. This new release includes various novelties by which companies can face the challenges of data growth, administration of inactive data and long-term storage efficiently. From now on also authorized users are able to archive data independently. Furthermore PoINT Software & Systems had extended the list of supported storage systems considerably. Version 5.0 supports now also the operating system Windows Server 2012 R2 and contains an optimized integration of Blu-ray Disc libraries by PoINT Jukebox Manager. Siegen. Steadily growing data volume forces companies and public institutions to intensify their storage strategy requirements. For saving costs for expensive primary storage extensions as well as for backup licenses file tiering – the purging and archiving of inactive data to secondary storage – is suggested. PoINT Software & Systems GmbH offers PoINT Storage Manager - a fully-developed software solution covering versatile functions and interfaces. Users profit from efficient storage usage, offloaded backup, cost savings and the fulfillment of compliance requirements. Siegen. As of now users of PoINT Storage Manager are able to purge files independently and without support of their administrator to secondary and archive storage. The expensive and often limited primary storage can be used more effectively by manual purging of files as only by automated purging. For this reason the data and storage management software of PoINT Software & Systems GmbH takes a step forward in comparison to other solutions purging data exclusively according to policies given by administrators. Siegen. 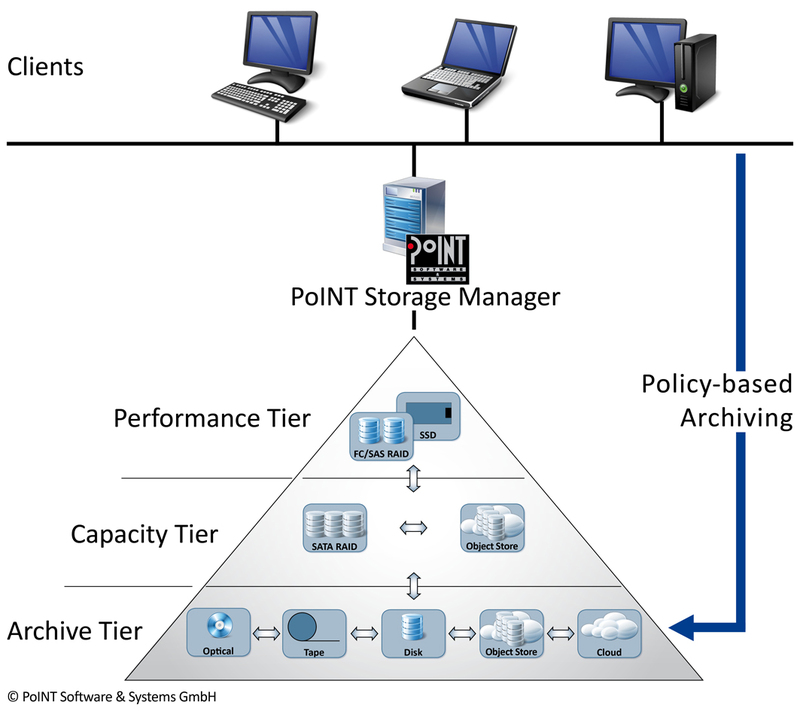 PoINT Software & Systems GmbH had integrated a replication function in its PoINT Storage Manager by which data can be replicated to storage systems within the capacity and/or archive tier. Data is stored in an automated and transparent manner according to pre-defined policies to a corresponding replication device. Besides an improved data security the specific technology advantages can additionally be used selectively by integrating different storage technologies. Siegen. Growing data volume and stricter obligations regarding data storage require intelligent and compliant long-term archiving. PoINT Software & Systems GmbH offers by its products PoINT Jukebox Manager and PoINT Storage Manager efficient solutions for companies. By both products long-term archiving can be implemented efficiently into already established workflows and integrated seamlessly into an existing storage infrastructure. Access to archived data remains transparent. PoINT Software & Systems GmbH is specialized in the development and distribution of software products for storage, management and archiving of data.